Of all the notions to make the young man-about-town shiver in fear, there’s nothing quite as soup-stained, floral-carpeted and suffocatingly musty as fuddy duddyness. A sleek young chap in his slim dark jeans and grey flannel blazer draws a hand through his smooth hair, fresh from a cocktail in some private Soho haunt that no one knows about (but pretends they’ve heard of) he glances sideways at the slow-moving traffic on Regent Street, and marches across the empty road with an admirable air of ownership, his sleek Gaziano & Girling shoes skipping onto the kerb. Waiting, on the other side of the grand thoroughfare, is what is affectionately termed ‘an old boy.’ Of advanced years, he looks around with a sense of dread, unsure of the London that is – quite unlike the London he knew – he tentatively looks both ways, his arms nervously clasped behind the back of his blue double-breasted blazer, his grey Farah trousers falling onto a pair of black polished-but-shapeless comfort shoes; his regimental tie suggests he has spent the afternoon at a dusty old club on Pall Mall. One glance at the ‘old boy’ and most would dismiss him as a fuddy duddy, a crusty. And not, as one would think, by his age. No indeed. 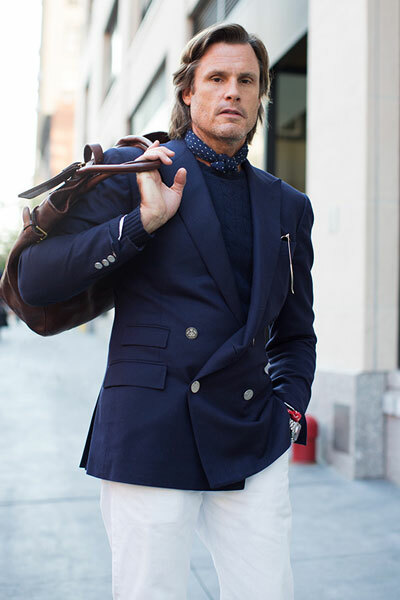 Many would make the same judgment about a man half his age if he happened to be wearing that erstwhile symbol of the Riviera yacht club, that tunic of the golf-club generation; the brass buttoned double-breasted navy blazer. The issue with the double-breasted aesthetic is that it requires consideration of three very important things: three ‘F’s – fit, fabric and fittings. Designers of off-the-rack double-breasted suit jackets and blazers often get these things horrendously wrong and there are also many tailors who will robotically recommend only the ‘traditional’ to their clients. Here is a guide on avoiding fuddy duddyness in when double-breasting. Firstly, it is far harder to achieve a satisfactory cut in a double-breasted jacket than a single breasted jacket. Off-the-rack versions are notoriously block-like and lack the shape at the chest and waist of single-breasted equivalents. A good alterations tailor will be able to whittle something out of it, but the best solution is to get it made-to-measure. Avoiding fuddy duddyness: ensure that the jacket is cut as slim to the waist as possible, and slightly shorter than standard. Navy DB blazers and suits are often made in mid-weight fine wools and, perish the thought, wool-blends. They’re suitable fabrics for suits and blazers but very much the stereotypical Conservative Club aesthetic. Avoid. Avoiding fuddy duddyness: Use mid-to-heavy weight flannels for suits and sackcloth for blazers. They have a matte texture and more rugged, less refined character that separates them from the expected fine wools. The brass six-button DB blazer is a thing of beauty but, much like Pachelbel’s Canon, the Mona Lisa or a red rose, overplayed and nauseatingly ubiquitous. No matter how much you experiment – darker, lighter, plain, engraved, beaten, polished – the effect is still that of an inescapable uniform. Avoiding fuddy duddyness: If you insist on metal buttons on a blazer, choose chrome or gunmetal. The latter are more subtle. For something more even more recherché, choose brown horn buttons; you’ll hardly see them, but that’s rather the point. If you are confident you want to avoid any hint of the classic blazer aesthetic, choose a four-button model with dark horn buttons. Another difficult with DB is who to deal with them when you sit. Once you unbutton them they have a tendency to lose their shape. Well written. Enjoyed reading this, especially the opening para. I recently bought a navy blue DB blazer, with shiny buttons and all. Though the same size and many other jackets I own, if feels huge and baggy, and I really have to get it taken in somehow before the summer. And the shiny buttons have to go. Pewter maybe would work.